↑ "Malaysia Airlines Recovery Plan Quarterly Update (1 Sept-30 Nov 15)." Malaysia Airlines. Retrieved on 5 May 2016. ↑ Chan Tien Hin. "AirAsia Has Record Drop on Loss, Analyst Downgrade." Bloomberg L.P.. 1 December 2008. Retrieved 27 September 2009. ↑ "Location Map ওয়েব্যাক মেশিনে আর্কাইভকৃত ১ জানুয়ারি ২০১০ তারিখে." MASkargo. Retrieved 22 February 2010. "Malaysia Airlines Cargo Sdn. Bhd. 1M, Zone C, Advanced Cargo Centre KLIA Free Commercial Zone, Southern Support Zone Kuala Lumpur International Airport 64000 Sepang Selangor, Malaysia "
↑ "Contact Information ওয়েব্যাক মেশিনে আর্কাইভকৃত ৯ আগস্ট ২০১৭ তারিখে." Malaysia Airports. Retrieved 23 May 2011. 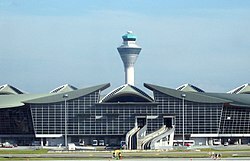 "Malaysia Airports Holdings Berhad Malaysia Airports Corporate Office, Persiaran Korporat KLIA, 64000 KLIA, Sepang, Selangor."